DUP’s Peter Robinson swept office for hidden bugs and believed spooks were listening to phone calls. Former DUP leader Peter Robinson was so concerned that British intelligence was spying on him that he bought equipment to sweep his offices for listening devices, according to a well-placed unionist source. The insider has also claimed that Mr Robinson and another ex-DUP leader, Ian Paisley, used to exchange handwritten notes at meetings to share sensitive information rather than talk openly about their plans. The allegations from the former DUP official comes just days after former Deputy Prime Minister John Prescott revealed Mr Paisley’s phone had been tapped while he was an MP. The Labour politician – now Lord Prescott – wrote in a newspaper column at the weekend that the security services had been listening in to Mr Paisley’s calls. 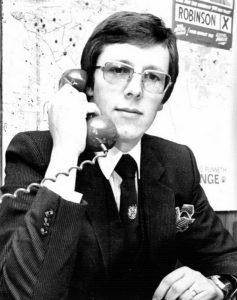 The late First Minister’s MP son Ian Paisley described the phone tap as utterly disgraceful and vowed to raise the issue at Westminster. But Tony Blair denied the claims. His office said that Lord Prescott was wrong and that no authorisation for the phone tapping of an MP was ever given during Mr Blair’s time as PM. However, sources within the DUP have said leading members like Peter Robinson had long been convinced that British intelligence and like-minded spies within the Army had placed them under surveillance from early on in the Troubles. Mr Robinson’s concerns were apparently heightened around the time of the loyalist ‘invasion’ that he led into the Monaghan village of Clontibret in August 1986 when he was arrested. The release of government files subsequently disclosed that the RUC had tipped off the Garda about the incursion plans by Mr Robinson who, it’s understood, gave his police bodyguards the slip by leaving his home under their noses covered by a blanket in the back of a car. After Clontibret, the then Chief Constable Sir John Hermon withdrew Mr Robinson’s protection and the then East Belfast MP bought himself a specially adapted Mercedes car from England. But the source said that Mr Robinson also purchased hand-held electronic equipment in London to enable him to search for bugging devices in his office in east Belfast. The insider added: “Peter feared that because of the DUP campaign against the Anglo-Irish Agreement, the intelligence agencies were interested in finding out what the party were planning with regard to protests. You would see Peter and Ian Paisley sliding bits of paper across the table with dates and timings of meetings or rallies. The former DUP insider said that even in later years when the protests against the Good Friday Agreement were gathering momentum, unionist leaders were all certain that their calls and activities were being monitored. He said: “A number of politicians raised their unease with senior RUC officers who told them the police weren’t engaged in the eavesdropping operations against them, but didn’t rule out the possibility that other agencies were. “There was a great deal of nervousness around at the time and I remember one figure who was prominent in the campaign against the Belfast Agreement stopped me from mentioning any names in phone conversations. Throughout the Troubles and even after they were over, republicans repeatedly claimed that the security forces and intelligence agencies were bugging them and tapping their phones. A number of listening devices were put on display by Sinn Fein down the years. In 1999, Sinn Fein president Gerry Adams produced a sophisticated electronic device which he said had been used to spy on himself and Martin McGuinness in a car they used during decommissioning talks with the IRA. Mr Adams cited the bug as evidence that intelligence elements were intent on undermining the Good Friday Agreement. In 2004, Sinn Fein showed the media a listening device which they said was found at the party’s Connolly House headquarters in west Belfast and another which they claimed had been uncovered at the home of a woman who worked for Mr Adams. Late last year an undercover British soldier claimed he planted listening devices in the homes of senior Sinn Fein officials years after the IRA ceasefire in 1994. The former intelligence officer who worked for the controversial Force Research Unit said many of the bugs were probably still in place. One, he said, was in the Londonderry home of Sinn Fein Assembly member and former hunger striker Raymond McCartney.